Cold brew coffee is a hot new item. I have heard a lot about this new way to brew coffee and I finally had a chance to try a cup last weekend when I attended a local coffee and chocolate fest. This coffee had great flavor and I knew at once that I needed to make this coffee at home. So what exactly is cold brew coffee? It is a method of brewing coffee with cold water that results in a rich concentrate that has deep, complex flavor. 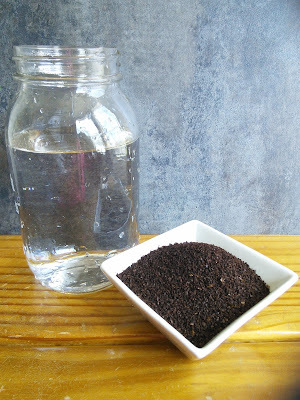 You simply steep coarse ground coffee in water for 12-24 hours to make the coffee concentrate. Then you dilute the concentrate and add your desired fixings like milk and sugar. You can enjoy it hot or cold. This concentrate keeps in the fridge for 10 days and tastes just as good as when it was first brewed, without the added time of grinding and brewing each morning. 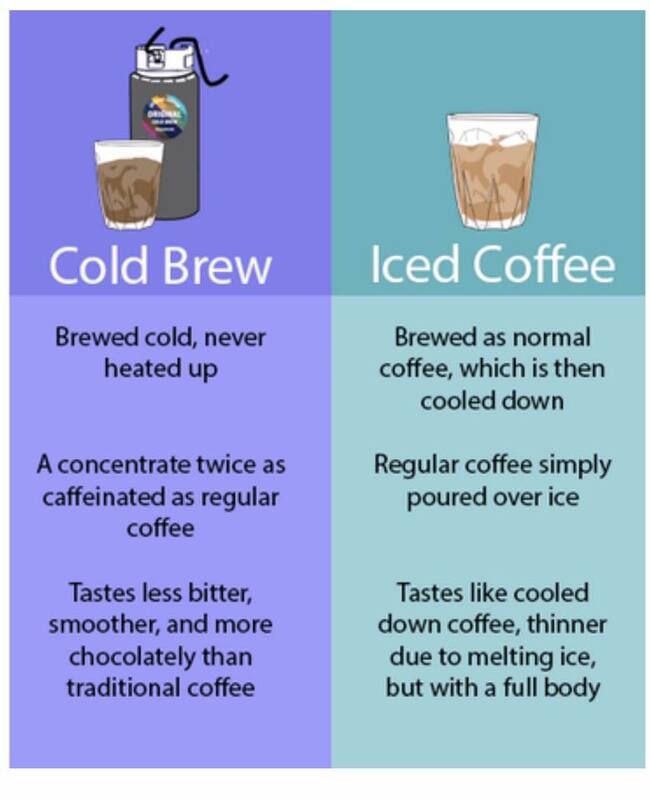 This picture compares cold brew coffee to ice coffee to help you understand what cold brew coffee. One of the best reasons to cold brew, after the great taste, is the acid is reduced. That means it is better for the lining of your stomach, reducing acid reflux. The cold brew coffee tastes less bitter. The best reason to cold brew coffee is for the mellow, smooth and on the sweet side taste that comes from brewing the right coffee. 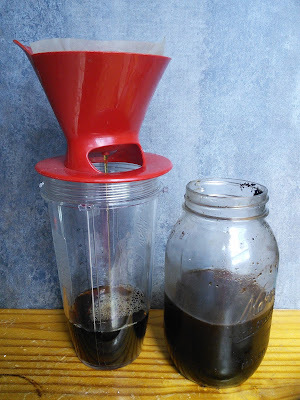 I am going to show you how easy it is to make cold brew coffee. You will be amazed, like me, and wondering why you have not done this sooner. 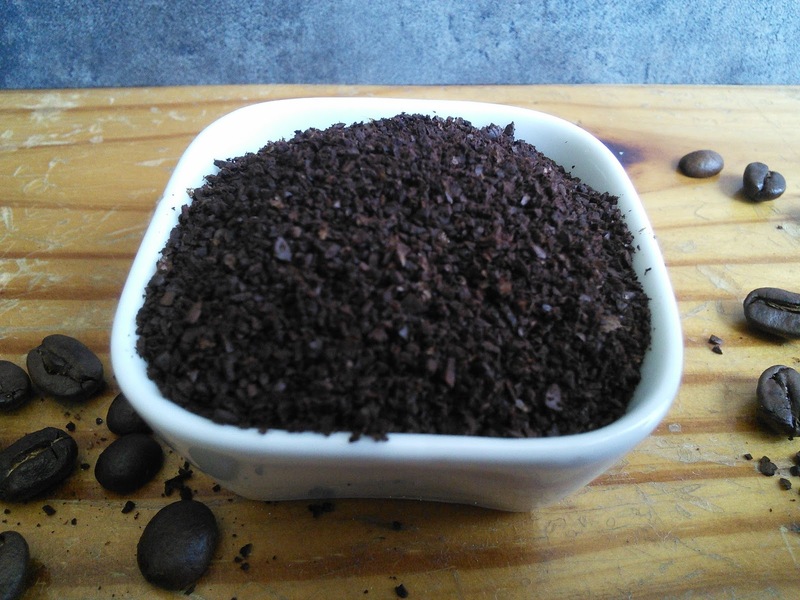 You start with high-quality coarse ground coffee. 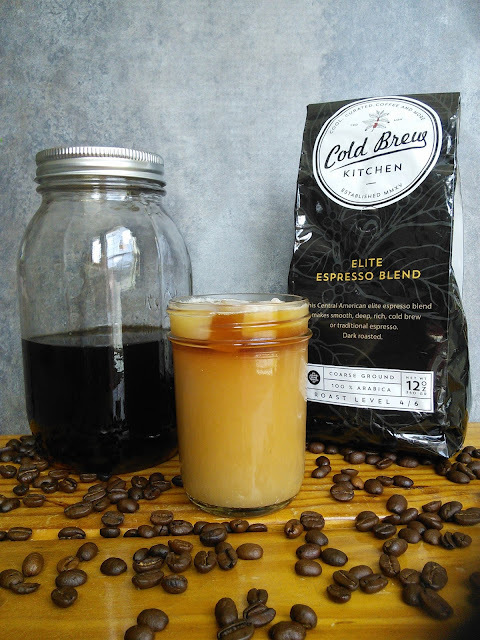 I like using Cold Brew Kitchen coffee as they are the first line of coffees dedicated to home cold brewing. 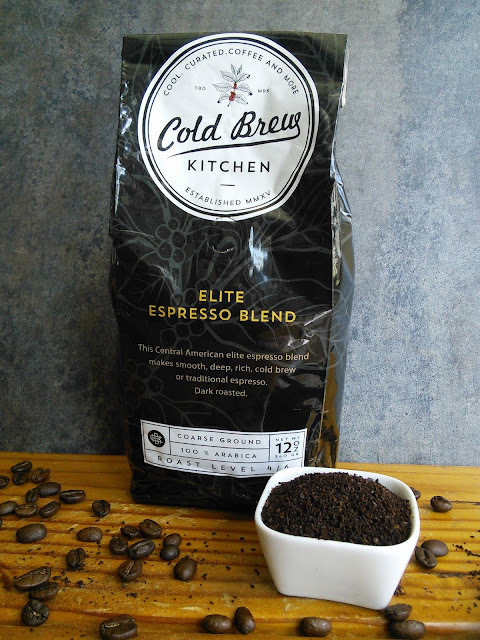 I wanted my first experience with making cold brew coffee to taste the best.This coffee comes in 4 varieties, I chose the Elite Espresso for the bold taste. 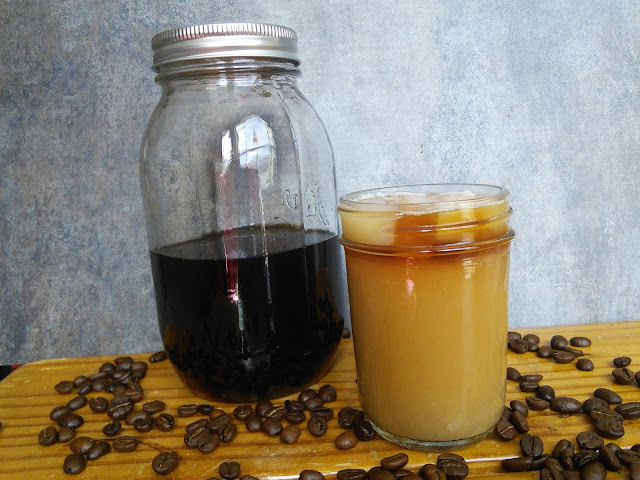 This Central American coffee makes a smooth, deep, rich cold brew coffee. You can also use it for traditional espresso. I just love how rich this coffee looks and it smells wonderful too! To make the cold brew coffee, I recommend using filtered water for best flavor. You can make a large or small amount. I started with 3 cups of water and added 3 ounces of ground coffee.The ratio that I made is 1 ounce of coffee to 1cups of water. The directions on the bag called for 7-10 cups of water to the whole 12-ounce package of coffee, but I knew I could not drink that much coffee in a week, so I chose to make a small batch. I placed the water and coffee in a container with a lid. I then stirred it well and placed the mixture in my fridge for 12-24 hours. You can also leave it to brew on your countertop. 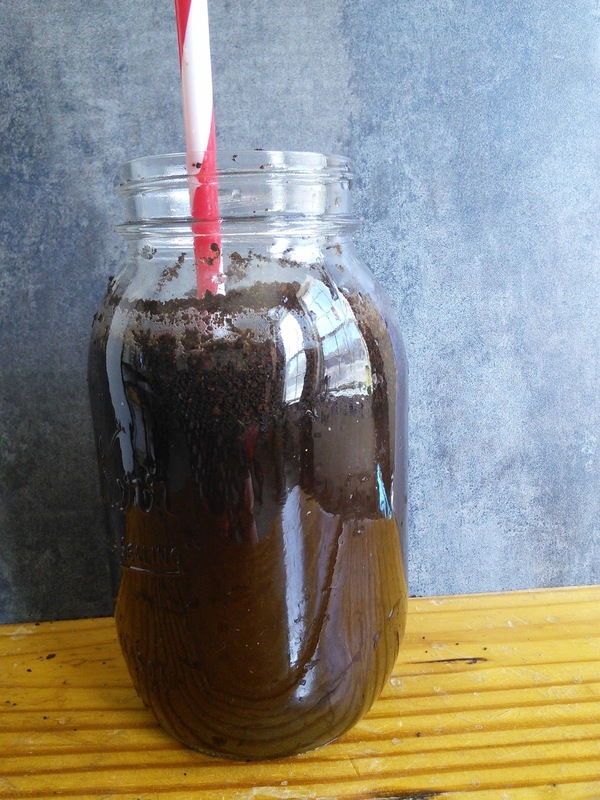 I cold brewed my coffee grounds for 20 hours as I just could not wait any longer. Then you strain the coffee, through a paper coffee filter or a fine-mesh bag, into another container. To enjoy the coffee cold, use 1 part coffee concentrate to 1-3 parts to water, milk or nut milk. To enjoy hot, combine the coffee concentrate with 1-3 parts hot water. Add your sugar, if desired and enjoy. I like my coffee mild, so I added 1 part coffee concentrate to 2 parts water and 1 part almond milk. I also added some sweetener. The first sip of my cold brew coffee was amazing and delicious. I think I will be cold brewing more often. Directions to make cold brew coffee are also printed on every bag of Cold Brew Kitchen coffee. 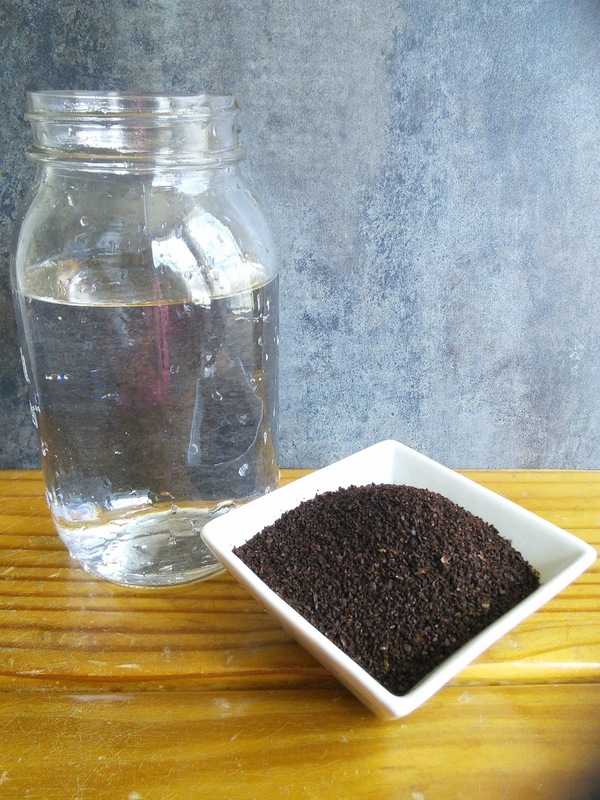 Combine the filtered water and coffee in the large mason jar. Place the lid on the jar and place in the fridge or on the countertop for 12-24 hours. Place the paper coffee filter in the strainer or filter. Then place the filter on top of the other empty mason jar. Pour the coffee concentrate through the filter to strain out all the coffee grounds. Store the coffee concentrate in the fridge for 7-10 days. To enjoy the coffee cold, use 1 part coffee concentrate to 1-3 parts to water, milk or nut milk. To enjoy hot, combine the coffee concentrate with 1-3 parts hot water. Add your sugar, if desired and enjoy. This makes 3 cups coffee concentrate which then makes 6 or more cups depending on how much you use per serving. Make sure to weigh your coffee grounds as I discovered that 3 ounces of my coffee equaled a 3/4 dry measure cup. "These opinions are my own and I received a bag of Cold Brew Kitchen Elite Espresso Blend to facilitate this post"
I am a coffee addict. This sounds perfect to me. Wow, this is so cool!! Coffee is such a versatile product! I have got to try this. So I pinned it so I don't have to remember the instructions. I haven't had coffee in ages - but this looks super good and I think I need to break my abstinence and go for it! I had no idea this was so easy to make at home! Do you realize how much monry this could potentially save me? I buy the big things of cold brewed coffee at least 3 times a week. I really want to try this! I only drink ice coffee and this would be great for me to make at home and a money saver! Didn't know cold brew coffee was a thing, you've made me real curious about it, im gonna give it a try it looks so strange but tasteful. I love the idea of making a cold brew coffee. Just imagine how perfect this is for the Summer. It's already warm and it would be nice to have this instead of your usual hot cup of coffee to kick start your day or even to enjoy during the warm afternoon. A must try. Thanks for sharing your steps and procedure. Seems very delicious too! I would love to do this! Me and my wife are really coffee lover. I love this. I want to try it, I can't wait! Thanks for sharing. I never knew the difference between cold brewed and iced. Now I do. Thanks! Wow! Didn't know there was a difference. I will have to try for my husband as he likes cold coffee. That's interesting. I rare ever have cold coffee but I'd love to try this cold brew! A coworker of mine makes cold brew coffee all the time. Until she started working here I had never even heard of it. It looks easy enough. Looks like a long process for me but it would be worth the taste. I would love to try it! Thanks for sharing. I've never made cold brew before, but I love buying it so I have to try this! This post has perfect timing! It's starting to get hot here and is about time to switch over to cold coffee for me! This cold brew thing was also taught to us by Starbucks. It was pretty cool and really different. What?! I never knew you cold brew coffee cold! What a great idea! A Coffee lover here too :) I shall try this on weekends hihi thanks for sharing this awesome idea!